Peakles took part in her school Harvest Festival recently and wanted to make some more Harvest crafts. Sometimes we make some simple arts and crafts because it is fun and a great way to learn together. We also like to use our creations to decorate our home as well. With this in mind, we decided to check some of the following ideas out during the half term holidays. Click through on the links to find out how to make these wonderful arts and crafts activities for kids. 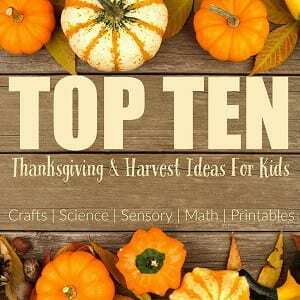 We are happy to be sharing these wonderful ideas as part of the Top Ten Blog Hop for October. Click through on links to find out what my colleagues have been writing about this month. I want to try that button pumpkin – it looks easy but comes out beautiful, too!